Welcome to the hardest working part of my house - the hallway. This is also the spot where I fell in love with this house - from the doorknob to the hall stand to the pocket doors, it has a lot of personality. But it also happens to get a lot of abuse as the only entrance and general dropping ground for just about everything. This is where we pull off our muddy boots, greet guests and get ready to go out everyday. After the terrible winter we have had (see how I've already declared winter is over? Wishful thinking! ), I wanted to show it some love and give it a tiny makeover. It feels a lot cleaner and cozier now but most importantly it's A LOT more functional with a more powerful light fixture, a place to hide/store our shoes and a rug to add some color and protect the floors from the worst of the weather. The existing light fixture was on my hit list for years because its single bulb was not providing anywhere near enough light. Once the sun went down, we could hardly see in here. So I knew I needed something with more bulbs but it wasn't until I spotted this classic 3 bulb Satellite fixture in unfinished brass that I was inspired to actually do something about it. I love it! Want to see the before? Click to see how it looked 2 weeks ago or 7 years ago. pssstt… Love the new fixture as much as I do? Stay tuned for a great giveaway from Schoolhouse Electric! Love that funky light! And that shoe crate is too cute! Your hall stand is gorgeous and I love thew new light fixture! gorgeous! I would have bought the house for that entry too. since we don't have a proper entry I've become obsessed with them. oh i love it! we have a bushel basket we use for shoes and i have never thought of labeling it- love that! I wish my entryway was a bright and airy as yours! Love that shoe crate and the painted detail. Wow, now is definitely better than the before-7-years version. Looks so...lighten-up. I love the crate! Our entryway has scattered shoes all around – I gotta find us a crate. Thanks for the idea. It's beautiful! 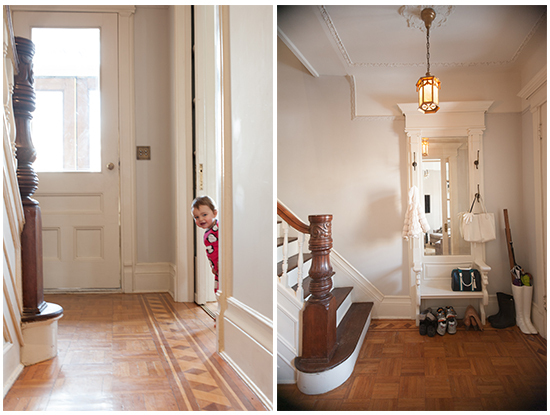 Love your entry way space - it's warm and welcoming and full of character! Do you make and sell those crates? If so, yes please! I would take one for certain!!!!!! !